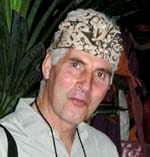 Peter Wrycza, founder of the Nirarta Centre for Living Awareness in Bali. Peter says: “In 1995 I stood in a grove of clove trees overlooking a river in a serene valley between the sea and the mountains and realized that this was my moment of choice. I could stick with my familiar work and territory in Europe. Or I could take the risk of buying land in a far-off place, and create a centre for people to connect with the core of their life.” Balinese philosophy emphasizes harmony between one's own 'small world' and the wider world around us. Perfect for the transformational experience offered here for those in search of renewal and inspiration for life and purpose. Peter is co-author of Living Awareness: Awakening to the Roots of Learning and Perception; and When Performance Meets Alignment: A Compass for Coaching and Mentoring. He coaches and consults to leaders around the world. Listen to this episode of Leading Conversations with Cheryl Esposito for a taste of the Nirarta experience!